As medical contractors, it’s important to promote healthy eating habits wherever you’re stationed. Healthy eating choices are the same all over the world—less pizza, more vegetables, and drink plenty of water. As a nurse or other healthcare professional, you can encourage your patients to make these good choices for themselves and follow up with support and advice when necessary. Broaching these subjects can be touchy, and some patients may usually rather not discuss them, but National Nutrition Month is a great way to get the conversation started on healthier eating. As a healthcare professional, how you open topics like health, weight, and nutrition is so important. Remember as you discuss these issues that the patient may be sensitive on the subject, and to convey the information they need to hear kindly but clearly. And show compassion—someone is more likely to implement the changes you suggest if it doesn’t feel like a personal attack. Keep this in mind as you advise your patients to put down the pizza or chips and reach for whole fruits and veggies instead. Be kind! It can sometimes be hard for medical professionals to educate their patients about nutrition if they were not trained on it themselves in medical school—which is often the case. However, it can often be beneficial for healthcare professionals to educate themselves on the subject so that they can better advise their patients, and also so that they can take better care of themselves in the long run. Studying nutrition science, learning to cook, and making healthier choices yourself can help you take better care for those in your care. If one of your patients needs extra guidance or shows a serious interest in their own nutritional health beyond what you or any other medical professional they are currently seeing can provide, don’t be afraid to refer them to a registered dietitian. A dietitian specializes in nutrition and their expert advice and counseling can help your patients who are serious about weight loss or a particular athletic objective achieve their goals. Building a strong relationship with a dietitian nearby will serve you and your patients well. As a nurse or other medical professional, it behooves you to make good dietary choices. 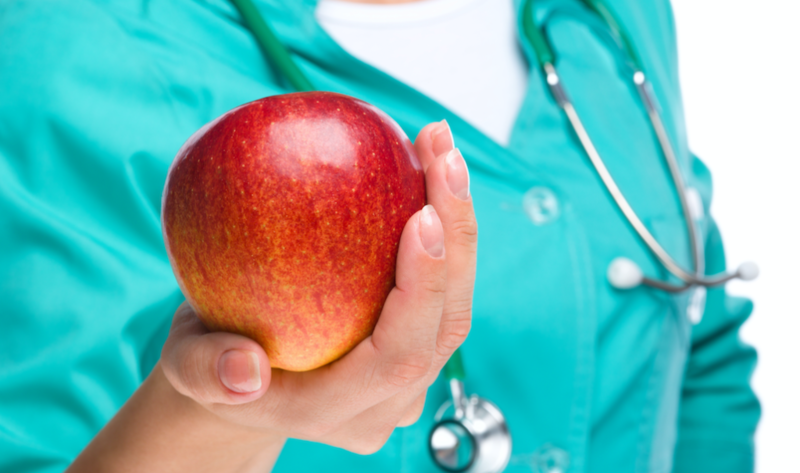 Since you’re a healthcare professional, on matters like nutrition, you can lead by example. Skip the processed vending machine food and do better than pizza on your lunch break. Learning to cook can do wonders for your health and your ability to take the best care possible of your body, as you will be able to avoid processed food and provide yourself with more nutritious meals that are high in protein and include fruits and vegetables. If you’re a medical contractor ready to make a difference in the world with your next position, check out our jobs page!